Leading ethnic wear brand Soch announces the much awaited Red Dot Sale in all outlets across India from June 15th 2017 till July 31st, 2017. The sale features a variety of elegant sarees, salwar kameez, kurtis, kurti suits, readymade cocktail blouse, tunics and bottoms for women at unbeatable prices. 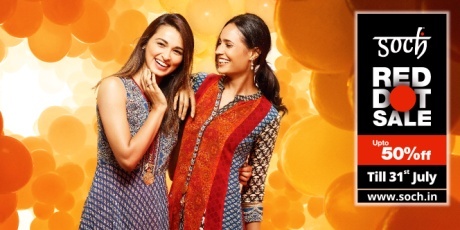 The exclusive Red Dot Sale brings a wide range of designer ethnic wear from its existing collections and fresh designs brought in especially for this limited offer. The Red Dot sale include season's best sellers such as the irresistible Nicci, Yana, Ziva, Samara, Evita, Alyssa collections which will be available on discount during this period. The offer showcases an array of ethnic wear that is both stylish, yet traditional with intricate designs and bright vibrant colors.